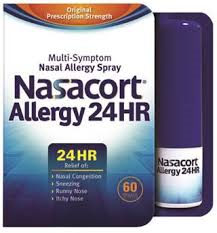 The over the counter availability of this new nasal spray may lead to questions from local Tulsa allergy sufferers. To help eliminate confusion, Dr. Lynn Wiens, along with the American College of Allergy, Asthma and Immunology (ACAAI) have answered the seven most common questions. 1. Is it safe? Not only can the new nasal allergy spray relieve congestion, sneezing and a runny nose, it also does not cause drowsiness and is non-habit forming. Improper use of nasal sprays may cause nasal bleeding. Follow the package instructions and inform your allergist if bleeding occurs. 2. Can I stop antihistamines? If you find solely using the nasal allergy spray is helping to suppress your symptoms, you may not need to take an antihistamine. Each person is different and they will have to be the judge of how they feel only using one medication. However, if you’re not finding relief from one or both medications, you should speak with your allergist. 3. Is it safe to give my child? The medication is approved for children two-years and older. But it may complicate some infections your child might have, so check with your allergist. 4. Can it be used year-round? Yes, it is approved for year-round use. Many allergy sufferers that have year-round allergies to pets, dust and mold often find nasal sprays are not enough for symptom relief. Many allergists prescribe immunotherapy (also known as allergy shots), which not only provides symptom relief, but can modify and prevent disease progression. 5. Will my insurance cover it? It is unlikely your insurance provider will cover over-the-counter nasal allergy sprays, even if it was covered when it was prescribed. 6. Do I need to continue following up with my allergist? Allergy sprays are merely a medication and not a cure for allergy. Because allergies can change over time, it’s important to be under the care of an allergist for proper testing, diagnosis and treatment that may go beyond over-the-counter medications. Allergies can also cause symptoms such as chronic sinus infections, nasal congestion or difficulty breathing.